A devotional medal of the Virgin Mary. A religious, or devotional medal, in the Roman Catholic faith, is a piece of metal, often worn around the neck, commemorating some aspect of the Catholic religion, in the form of a person (from Christ himself, to popes, to saints), place (such as churches or shrines), and idea (such as faith itself), among other things. The varieties and number are so high as to be nearly uncountable. They exist to remind the wearer of his or her faith in God, to offer a way of communication with that God through a saint, and in general to strengthen one's beliefs. These medals have their roots in the very beginnings of Christianity, as an attempt to usurp similar pagan designs, but over hundreds of years, developed into their own unique and often beautiful form of art. They represent a melding of artistic talent and religious belief. Devotional medals are symbols created by the Church for the purpose of reminding the believer of his or her faith or religious duties. The medal is usually made in the form of a coin, not used for money, but struck or cast from metal for commemorative purposes. They are adorned with an effigy, device, or inscription, often indicative of a specific event or person. While there are many such secular medals, they are overwhelmed by the number and variety of devotional medals. A box of contemporary medals dedicated to the holy family and various saints and other, most with the entreaty, "Pray for us" on the reverse. Medals may commemorate people, such as Christ or the Virgin Mary, or Saints, among others, place like famous shrines or churches, and past historical events such as dogmatic definitions or battles. They may also be more personalized and reflect events such as a First Communion, Ordination, or baptism. They may also center around an idea, such as faith itself or the Blessed Sacrament. The craftsmanship on the medals varies. Ancient medals, especially those that still survive, tend to be very ornately, intricately, and exquisitely decorated. And while the art may have declined as the medals' demand grew and they eventually found themselves inexpensive enough for the common people to acquire them, they work still remained highly detailed and well crafted. There was a time when the existence of early devotional medals was considered to be quite dubious, especially in the early days of Christianity. Certain objects of this kind were described and illustrated by seventeenth century writers on the Catacombs, and a few were preserved in museums. This evidence, however, was met with a great deal of suspicion until the appearance of an article by Giovanni Battista de Rossi (an Italian archaeologist, famous outside his field for his rediscovery of early Christian catacombs) in the Bullettino di Archeologia, Cristiana, in 1869. de Rossi argued that a moment's consideration would establish the inherent probability of the existence of objects such as devotional medals. The use of amulets in pagan antiquity was widespread. The word "amuletum" itself occurs in Pliny, and many monuments show how talismans of this kind were worn around the neck by all classes. That the early Church should have found such pagan influence unacceptable and should have striven to counteract it by suggesting, or tolerating, some analogous practice of an innocent character, is in itself highly improbable. But that Christians of good name did wear such objects of piety around their necks is certain, and it is consequently probable that Christian devices, should have been cast in metal. In Africa, the molds have been found in which little crosses were cast with rings to hang them by. It follows, therefore, that certain coin-like objects, for which there exists good evidence of their being actually discovered in the Catacombs, must be regarded as genuine relics of the devotional practices of the early Church. Two or three of these are especially famous. One, which de Rossi attributes to the late fourth century, bears upon both faces the legend Successa Vivas, an "acclamation" which probably indicates that the medal was cast for a certain Successa to commemorate, perhaps, her dedication to God. One side represented the martyrdom of a saint, presumably St. Lawrence, who is being roasted upon a gridiron in the presence of the Roman magistrate. The Christian character of the scene is shown by the chi-rho chrisma, the alpha and omega, and the martyr's crown. On the reverse is depicted a cancellated structure, no doubt the tomb of St. Lawrence, while a figure stands in a reverent attitude before it holding aloft a candle. Other medals are much simpler, bearing only the chrisma with a name, or perhaps a cross. Others, impressed with more complicated devices, can only be dated with difficulty, and some are either spurious, or they belong to a much later epoch. Some of the medals or medallions reputedly Christian are stamped upon one side only, and of this class is a famous bronze medallion of very artistic execution discovered by Boldeti in the cemetery of Domitilla and now preserved in the Vatican Library. It bears two portrait types of the heads of the Apostles Peter and Paul, and is assigned by de Rossi to the second century. Other medallions with the (confronted) heads of the two apostles are also known and a lively controversy largely based on these medallic materials has been carried on regarding the probability of their having preserved the tradition of an authentic likeness. Certain supposed early medals with the head of Jesus Christ are particularly open to suspicion. How far the use of such medal of devotion extended in the early Church it is not easy to decide. One or two passages in the works of St. Zeno of Verona have suggested that a medal of this kind was commonly given as a memorial of baptism, but the point is doubtful. 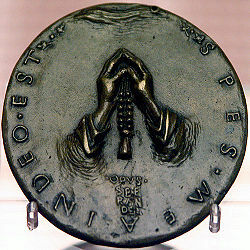 A devotional medal made of bronze. While it is probably that the traditions described above continued into the Middle Ages and never entirely died out, little evidence has been found to support the use of medals during early medieval times. Although pinpointing the date at which point one first hung a medal around the neck with a religious intent is, for obvious reasons, quite difficult, no trace of such sacred objects survives which remarkable either for artistic skill or the value of the metal in this period. The "ampulles" probably represented Canterbury, but may have been tokens of the Holy Tear of Vendome. The "shelles of Galice," that is, the scallop-shells of St. James of Compostella; the crouche, or cross, of the Holy Land; the keys of St. Peter; the "vernicle," or figure of the Saint Veronica, and so on, are all very familiar types, represented in most collections of such objects. The privilege of casting and selling these pilgrim's signs was a very valuable one and became a regular source of income at most places of religious resort. 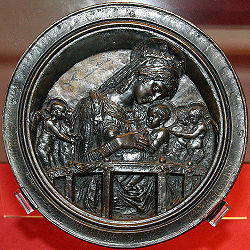 From about the twelfth century, the casting of these devotional objects continued until the close of the Middle Ages and even later, but in the sixteenth or seventeenth century, they began to be replaced by medals, properly so called, in bronze or in silver, often with much greater pretensions to artistic execution. 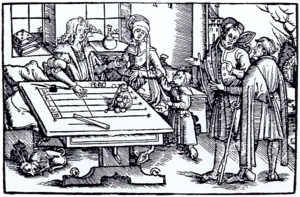 Counting table (woodcut probably from Strasbourg). The spaces between the lines function as the wires on an abacus. The place value is marked at the end. Jetons resemble Christian medals, and some of them came to be used the same way, but jeton were originally created for a different purpose. Jetons were a token or coin-like medal produced across Europe from the thirteenth through the seventeenth centuries. They were produced as counters for use in calculation on a lined board similar to an abacus. They also found use as a money substitute in games, similar to modern casino chips or poker chips. Thousands of different jetons exist, mostly of religious and educational designs, as well as portraits, these most resembling coinage. The Romans had similarly used pebbles, in Latin "calculi" - little stones. Addition is straight forward, and relatively efficient algorithms for multiplication and division were known. Jetons for calculation were commonly used in Europe from about 1200 to 1400, and remained in occasional into the early nineteenth century. As Arabic numerals and the zero came into use, "pen reckoning" gradually displaced "counter casting" as the common accounting method. In Italy pen reckoning became common earlier, and was mandatory for bookkeeping use by 1300. Nuremberg, Germany, was in the late Middle Ages an important center of production of jetons for commercial use. Later—"counter casting" being obsolete—the production shifted to jetons for use in games and toys, sometimes copying more or less famous jetons with a political background as the following. 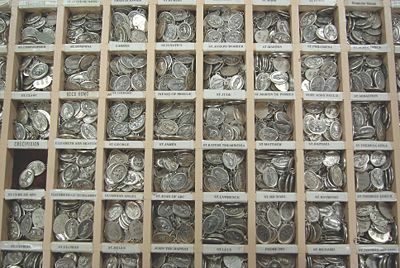 In "the Nederlanden," the Low Countries, the respective mints in the late Middle Ages in general produced the counters for the official bookkeeping. These mostly show the effigy of the ruler within a flattering text and on the reverse the ruler's escutcheon and the name or city of the accounting office. 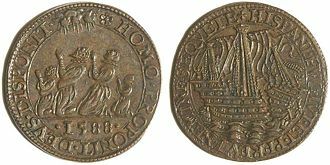 During the Dutch Revolt this pattern changed and by both parties, the North in front, about 2,000 different, mostly political, jetons (Dutch: Rekenpenning) were minted depicting the victories, ideals, and aims. Specifically in the last quarter of the sixteenth century, where "Geuzen" or "beggars" made important military contributions to the Dutch side and bookkeeping was already done without counters the production in the North was just for propaganda. In the twenty-first century, Jetons continue to be used in some countries to denominate the substitutes for coins in coin-operated public telephones or vending machines, because automatic valuation of coins by machines is unreliable or impossible due to several factors. They are usually made of metal or hard plastic. There is also a the vast collection of jetons and méreaux which, beginning in the thirteenth century, continued to be produced all through the Middle Ages, lasting in some places down to the French Revolution. The jetons were, strictly speaking, counters, that is, they were thin pieces of metal, mostly latten, a sort of brass, stamped on both sides with some device and originally used in conjunction with a comptoir (that is, an abacus or counting board) to perform arithmetical computations. The name comes from jeter, through the form jectoir, because they were "thrown down" upon this board. It soon became the fashion for every personage of distinction, especially those who had anything to do with finance, to have special jetons bearing his own device, and upon some of these considerable artistic skill was lavished. These pieces served various purposes besides that for which they were originally designed, and they were often used in the Middle Ages where in modern times one would now use a ticket or printed card. As might be expected, they tended to take a religious tone. Upon nearly half the medieval jetons which survive, pious mottoes are often found. Often, these jetons were given as presents or "pieces de plaisir," especially to persons of high consideration, and on such occasions, they were often specially struck in gold or silver. One particular and very common use of jetons was to serve as vouchers for attendance at the cathedral offices and meetings of various kinds. In this case they often carried with them a title to certain rations or payments of money, the amount being sometimes stamped on the piece. The tokens used were known as jetons de présence, or méreaux, and they were largely used to secure the due attendance of the canons at the cathedral offices. What especially justifies their mention in the present place is the fact that in many cases, the pious device they bore was as much or even more considered than the use to which they were put, and they seem to have discharged a function analogous to the Child-of-Mary medals, the scapulars, the badges and even the pious pictures of modern times. One famous example is the "méreau d'estaing" bearing, stamped upon it, the name of Jesus, which the famous Frère Richard, whose name is closely, if not too creditably, associated with the history of Joan of Arc, distributed to his followers in Paris, 1429. These jetons stamped with the Name, were very numerous and were probably closely connected with the apostolate of St. Bernardine of Siena. Finally, for the purpose of largess at royal coronations or for the Maundy, money given by the English sovereign to the poor on the Thursday before Easter, pieces were often struck which perhaps are to be regarded as medals rather than actual money. 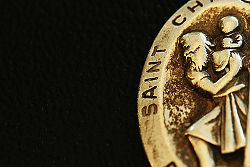 A devotional medal of Saint Christopher. The first known and documented appearances of medals with express religious purposes came about in the Renaissance as a form of popular devotion. Thus, proper devotional medals are a post-Reformation construct, beginning in the last few years of the fourteenth century. The first certainly known medal was struck for Francesco Carrara (Novello) on the occasion of the capture of Padua in 1390, but practically the vogue of this form of art was created by Pisanello (c. 1380-1451), and its first developments were all Italian. These early Renaissance medals, magnificent as they were, belong to secular life but many of them possess a strong religious coloring. Nothing more devotional could be imagined than the beautiful reverse of Pisanello's medal of Malatesta Novello, where the mail-clad warrior dismounting from his horse is represented as kneeling before the crucifix. But it was long before this new art made its influence so far widely felt as to bring metal representations of saints and shrines, of mysteries and miracles, together with emblems and devices of all kinds, in an inexpensive form, into the hands of the common people. Undoubtedly, the gradual substitution of more artistic bronze] and silver medals for the pilgrim's signs at such great sanctuaries as Loreto or St. Peter's, did much to help with the general acceptance of medals as objects of devotion. Again, the papal jubilee medals which certainly began as early as 1475, and from which the nature of the case was carried into all parts of the world, must have helped to make the idea familiar. In addition, at some time during the sixteenth century the practice was adopted, possibly following a usage long previously in vogue in the case of Agnus Deis of giving a papal blessing to medals and even of enriching them with indulgences. On the other hand it is noteworthy that among the benediction forms of the Middle Ages, no single example is found of a blessing for numismata. However, a pilgrim's "insignia" were often blessed, but by this term referring only to his scrip and staff, not the leaden tokens spoken of above. The custom of blessing and indulging medals is said to have rapidly extended under the sanction of the popes. It is certain that Sixtus V attached indulgences to some ancient coins discovered in the foundations of the buildings at the Scala Santa, which he caused to be richly mounted and sent to persons of distinction. Thus encouraged, and stimulated further by the vogue of the jubilee and other papal medals of which we have still to speak, the use of these devotional objects spread to every part of the world. Austria and Bohemia seem to have taken the lead in introducing the fashion into central Europe, and some exceptionally fine specimens were produced under the inspiration of the Italian artists whom the Emperor Maximilian invited to his court. Some of the religious medals cast by Antonio Abondio and his pupils at Vienna are of the highest order of excellence. But in the course of the sixteenth and seventeenth centuries, almost every considerable city in Catholic Europe came to have craftsmen of its own who followed the industry, and the tradition created by such Italian artists as Leone Leoni at Brussels, with men, like Jonghelinck and Stephen of Holland for his pupils, and by John de Candida, Nicholas Of Florence and Benvenuto Cellini in France, was bound to have lasting effects. The number and variety of the religious pieces produced at a later date are so various as to defy all classification. Only one text, the Benedictine L. Kuncze's Systematik der Weihmuzen (Raab, 1885), seems to have seriously grappled with the task, and his success is very moderate. As an indication of the vast complexity of the subject, note that in the thirty-first of his fifty divisions, the section devoted to medals commemorative of churches and sanctuaries of the Blessed Virgin, he enumerates over 700 such shrines of which he has found some record—the actual number is probably immensely greater—while in connection with the majority of these, special medals have at some time been struck, often, for example, at Loreto, in an almost endless series. Under these circumstances, all that can be done is to point out a few illustrative groups rather apart from the common run of pious medals; those connected with places, confraternities, religious orders, saints, mysteries, miracles, devotions, and so on, are types with which everyone is familiar. 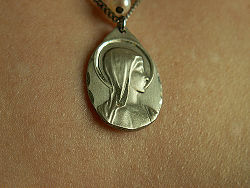 A modern devotional medal featuring the Virgin Mary. There were a very large number of these struck for jubilees, centenaries, and so forth, in the different places where these miracles were believed to have happened, often adorned with very quaint devices. There is one, for example, commemoration of the miracle at Seefeld, upon which the following story is depicted: A nobleman demands to receive a large host at communion like the priest's. The priest complies, but as a punishment for the nobleman's presumption the ground opens and swallows him up. These form a very large class, but particular specimens are often extremely rare, for they were struck to commemorate life of individuals, and were only distributed to friends. Baptisms, marriages, first communions, and deaths formed the principal occasions for striking these private medals. The baptismal or sponsor medals (pathen medaillen) are particularly interesting, and often contain precise details as to the hour of birth which would be used to calculate the child's horoscope. Of this class, the famous Cross of St. Ulrich of Augsburg serves as a good example. A cross is supposed to have been brought by an angel to St. Ulrich so that he might bear it in his hands during the great battle against the Huns in 955 C.E. Freisenegger's monograph "Die Ulrichs-kreuze" (Augsburg, 1895), enumerates 180 types of this object of devotion sometimes in cross sometimes in medal form, often associated with the medal of St. Benedict. Other types of medals have been struck by important religious associations, as for example by the Knights of Malta, by certain abbeys in commemoration of their abbots, or in connection with particular orders of knighthood. On some of these series of medals useful monographs have been written, as for example the work of Canon H.C. Schembri, on The Coins and Medals of the Knights Of Malta (London, 1908). ↑ Catholic Family Gifts, About saints and devotional medals. Retrieved August 15, 2008. ↑ 2.0 2.1 Joseph Glass, Devotional Medals, Catholic Encyclopedia. Retrieved August 15, 2008. ↑ Giraldus Cambrensis, Opera, Rolls Series, I, p. 53. ↑ Arthur Forgeais, 'Collection de Plombs Historiés trouvés dans la Seine IV, 65 sq. ↑ Jules Rouyer and Eugène Hucher, Histoire du jeton au Moyen Age par Jules Rouyer et Eugène Hucher. Première partie (Paris: Rollin, 1858, OCLC 223190979), 30. ↑ Jules Rouyer, "Le Nom de Jésus," in Revue Belge de Numismatique (1896). ↑ Cornelius von Fabriczy and Annie Hamilton, Italian Medals (London: Duckworth, 1904, OCLC 1262241). ↑ Anton Max Pachinger, Wallfahrts-, Bruderschafts- und Weihe-Medaillen der gefürsteten Grafschaft Tirol und Vorarlberg (Wien: R. Ludwig, 1908, OCLC 15225168). (German) Johann Peter Beierlein. Münzen bayerischer Klöster, Wallfahrtsorte und anderer geistlicher Institute. München: C. Wolf & Sohn, 1857. Catholic Encyclopedia. Devotional medal. New Advent. Retrieved August 15, 2008. Davis, Maryellen, and Thomas A Tweed. Mary as Media Icon: The Madonna in Twentieth-Century American Catholic Devotional Cultures. UNC Electronic Theses and Dissertations Collection. Chapel Hill, N.C.: University of North Carolina at Chapel Hill, 2007. OCLC 218325518. (German) Domanig, Karl. Die deutsche Privat-Medaille der älteren Zeit. Ein Vortrag. Vienna, 1893. OCLC 31810344. (German) Pfeiffer, Ludwig, and Karl Ruland. Pestilentia in nummis: Geschichte der grossen Volkskrankheiten in numismatischen Dokumenten : ein Beitrag zur Geschichte der Medicin und der Cultur. Tübingen: Laupp, 1882. OCLC 214489190. This page was last modified on 12 July 2016, at 19:34.